When you or a family member has suffered a brain injury or spinal cord injury, the impact on quality of life can be enormous. Permanent disability may result, including paralysis, quadriplegia, brain damage or coma. If the injuries are the result of negligence, the Blumenshine Law Group will file a lawsuit to recover damages. The lifelong costs of caring for a person with brain injuries or spinal cord injuries are greater than most insurance companies are willing to pay, and you need skilled legal guidance to receive adequate compensation. Some brain injuries are acquired when the brain is deprived of oxygen, while others occur after a blow to the head. When the brain does not receive an adequate supply of oxygen, cells can be permanently damaged. This type of brain injury may occur due to medical negligence, such as a delay in providing adequate respiration or the improper administration of anesthesia. A blow to the head or a penetrating head wound can result in traumatic brain injury (TBI), in which the brain itself is strained or torn. Falls and car accidents are the most common causes of TBI. Contusion. The brain is bruised. Concussion. The head is shaken and brain cell function is disrupted. Coup-contrecoup. The brain strikes the front and back of the skull. Diffuse axonal injury. The nerves and muscle tissue are torn. Penetration. An object or bone fragment cuts into the brain. A brain injury can reduce mental or physical abilities, and severe cases can lead to amnesia, blinding, coma or death. Contact our brain injury lawyers about filing a lawsuit when you suspect that a injury was due to negligence. It is very important that even the slightest spinal cord damage be taken seriously. 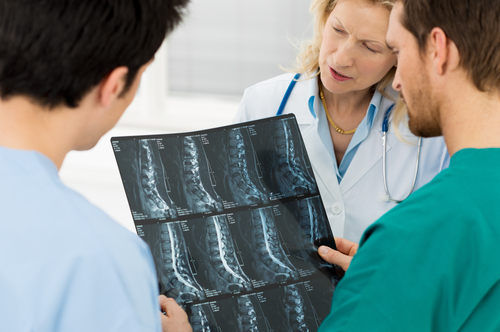 Spinal injuries can result in permanent nerve damage and partial paralysis including paraplegia or quadriplegia. Symptoms and side effects including pain, numbness and loss of control of limbs can vary depending on where the injury occurred. Areas of injury include the nerve roots, chest, neck, upper back, lower back or nerve roots that connect to the spinal cord. Anterior cord syndrome. Weakened sense of temperature and touch. Central cord syndrome. Loss of arm function. Posterior cord syndrome. Impaired coordination. Paraplegia. Loss of use of the legs. Tetraplegia, also called quadriplegia. Full paralysis below the neck. A standard medical insurance payout is unlikely to cover the expenses incurred after a spinal injury. If you need help from an experienced spinal cord injury attorney, we will first help you get the best medical attention and then work with you to get compensated by the responsible party or insurance company. We can meet with you to discuss your situation and possible claim. We work hard and are advocates for those dealing with difficult spinal cord injuries and we can help you in your time of need. You need support when you or a family member has suffered serious injuries. If someone’s negligence caused the injuries, you deserve to be compensated. Our Brain and Spinal Cord Injury attorneys take on the negligent party’s insurance company and negotiate a settlement. If the offer is insufficient, we go to trial. For a free consultation about your options, contact the Blumenshine Law Group or call us at (312) 766-1000. We help people in Chicago and all of Illinois.